Knotty Knotty Crochet: Little fairy boots. So this is my newest project. 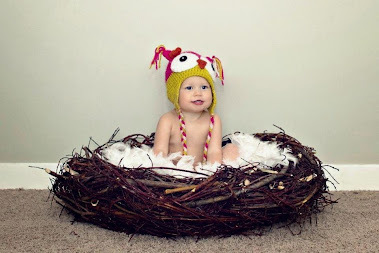 I don't have the pattern here, but I do however have a FREE link so that you can buy this pattern from someone else. I know, pretty cheap of me, but this one I just couldn't eyeball. Not only could I not eyeball the pattern, I couldn't even figure it out with the pattern. So I ended up watching it on youtube. (not the shoe part, just the crocodile stitch part.) I am super excited however to put this into a new pattern I have an idea for, so stay tuned for that! I used Bernat mosaic yarn with these ones, which claimed to be a worsted weight yarn...I would strongly disagree and call it more of a sock weight yarn, but I'm glad because these would not have turned out had I used a heavier yarn. And the best part? I'm pretty bad at booties because once I have made one I really dislike DESPISE making the second one. 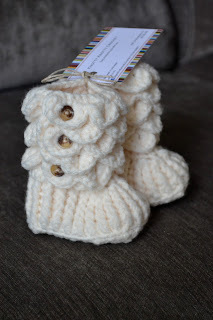 Perhaps it's a short attention span, or ADD or something like it, but with these I couldn't wait to --oh look booties! These were super fun to make! a custom order. I think I might try a pari in every colour in my basket! These turned out SO cute! :D I loooove them! :) I think I'm going to attempt this pattern on my own modifying a pattern I used to make Ugg inspired booties. Thanks for the creative motivation! What kind of yarn did you use for these? So sweet! Love the colors. I had to watch YouTube to figure out the crocodile stitch, but it was great and simple once I did and I love the look! Beautiful job! I just used Bernat's worsted weight for the cream and mosaic for the rainbow ones.